President A.P.J. Abdul Kalam addressing the Karnataka Rajya Vijnana Parishat silver jubilee function in Bangalore on Saturday. BANGALORE: The Comprehensive Test Ban Treaty has no relevance to India any more since the country was a nuclear weapons State since 1998 and confirmed its commitment to total nuclear disarmament, said President A.P.J. Abdul Kalam here on Saturday. He was inaugurating the silver jubilee celebrations of the Karnataka Rajya Vijnana Parishat. Mr. Kalam was in his elements while interacting with high school children of nearly ten schools. The children who were seated in the auditorium three hours were the happiest lot after their interaction with the President, which extended to nearly 45 minutes of the hour-long programme. In reply to a question from a student on the CTBT, Mr. Kalam said the treaty had lost its relevance for India. The country became a nuclear-weapons state in 1998 and has also made it clear ``we will not test further’’ apart from keeping away from ``no-first use’’ of nuclear weapons. On disposal of nuclear wastes, the President said the country had adequate facilities for disposal of such wastes and these facilities were located in the proximity of all nuclear reactors. He said he had got in touch with the chairman of the Atomic Energy Commission on this matter on Friday to have an update on the facilities for nuclear wastes disposal. 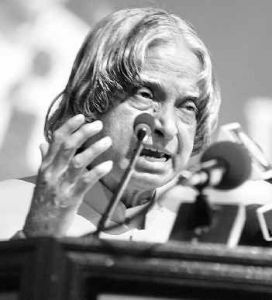 On achievement in the field of space technology, Mr. Kalam said the country entered the space sector in 1963 and the building of large rocket systems using indigenous technology was one of the biggest achievements. In 2007, the Indian Space Research Organisation was expected to send a spacecraft to the moon along with a payload and this would be another milestone. Referring to the Agni missile technology, he said it was indeed a unique challenge and the development of the re-entry technology which has since been perfected was a major achievement. The Agni missile had to be protected with a heat shield since the temperature during the re-entry stage increased up to 4,000 degrees Celsius. The payload in the system had to be obviously protected. ``We have developed a good heat shield". The President said it was essential to develop appropriate technologies that give immediate benefits to the people. It was imperative to package such technologies and also ensure political support for them to receive the necessary patronage. The President commended the work being done by the Karnataka Rajya Vijnana Parishat founded under the guidance of the late H. Narasimhaiah of the National Education Society, Bangalore. The KRVP has established over 500 school science centres across the State and has a continous programme to promote science and a scientific temparament. The silver jubilee celebrations of the KRVP is indeed a milestone for the organisation which has done a commendable job. Governor T.N. Chaturvedi, Minister for Science and Technology Basavaraj Horatti; KRVP president S.J.Nagalotimath and secretary H.S.Niranjana Aradhya also spoke.